To support the efforts of the medical and education programs, while providing volunteers a rewarding experience and giving local Jalapans opportunities to use existing building skills and learn new ones. Work with medical education director and in-country program representative to determine construction priorities for the following fiscal year. Recruit sufficient volunteers for each year's teams, finding a good blend of people with and without experience. Through contributions of ISLA volunteers, donors, and community members of the Jalapa school area, we were available to build a new school in just 12 days. 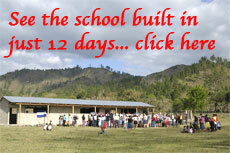 The school is now used by 120 students in the El Junco community. 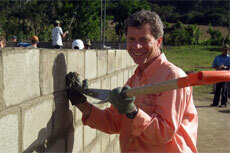 Our construction projects center mainly in the hospital and clinic and in schools located in and around Jalapa. Some projects involve other locations such as Oyanka – the women’s safe house. 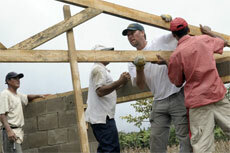 Most are ongoing and partner as much as possible with the local people. Some of the projects we do in the hospital involve installing solar tubes, creating solar heated water, repairing and installing electrical fixtures, painting walls and repairing the roof, plumbing and general maintenance. Other projects we do for the schools involve building bookshelves and benches, painting walls, chalkboards, working on electrical projects, repairing roofs and floors, building an outhouse and general maintenance. "We, the teachers, boys and girls and education community thank you for the inexplicable manner of support that you have offered that no one has ever before done for us. It is for this reason that we feel so proud for having someone like you to look after the most sensitive needs that our school has. God willing, we hope this will not be your last time that you are here. We hope that you will continue to help us support our children and to help us supply the basic needs of our children so that they can learn. We wish you success in each and every day of your labor. The Teachers of the School of El Portillo "